I found this recipe over at Kalyn’s Kitchen, where she posts South Beach Diet-friendly recipes. I’m not on the South Beach Diet, but I am trying to eat healthier and this one really appealed to me. The only change I made was to add a bit of honey to offset the sour vinegar, which was overpowering without it. Now I’m completely in love and hooked. I’ve made it twice in as many weeks! salt for pasta water, about 2 tsp. Bring a large pot of water to a boil, add salt, then break spaghetti noodles in half and add to water. Stir, let it come to a boil again, then cook until noodles are tender but still have a little bite, about 8-9 minutes. While pasta water is coming to a boil, grate enough fresh ginger to make 1 T, then combine with rice vinegar, soy sauce, vegetable oil, chili garlic paste (or sriracha), sesame oil, and honey. While the noodles are cooking, chop the chicken into same-size pieces about 1/2 inch square, and slice green onions. Wash cilantro, spin dry or dry with paper towels, and chop enough to make 1/2 cup. When noodles are cooked but still al dente, drain them into a colander placed in the sink. Put noodles back into pan you cooked them in and add the diced chicken. Pour sauce mixture over chicken and noodles, then toss well enough that noodles and chicken are well-coated with the sauce mixture. Add chopped green onions and chopped cilantro and toss just enough to combine. Serve immediately. 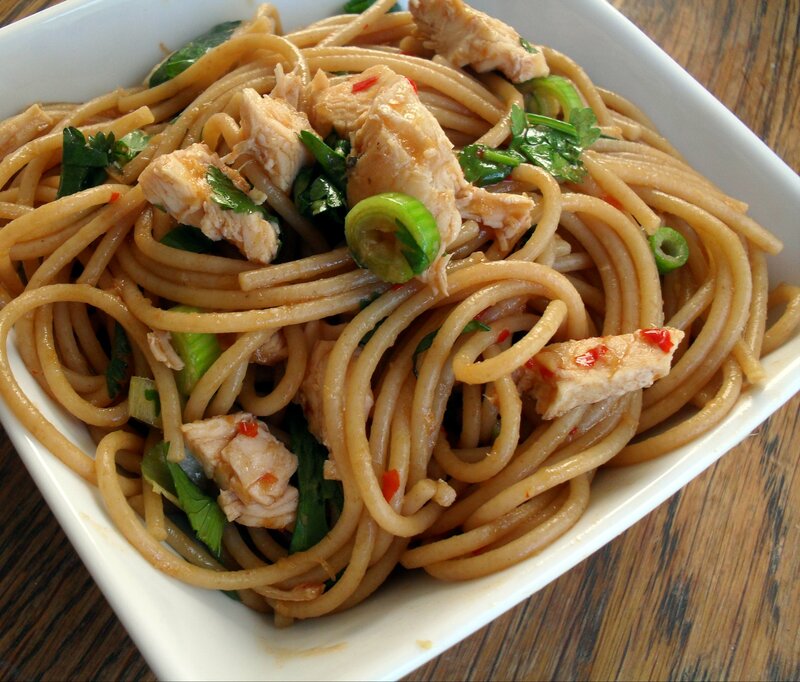 Posted in Asian, Lighter Fare, Pasta and tagged healthy, spicy asian noodles with chicken. Bookmark the permalink. We are on the same wavelength today, Veronica! This looks delicious! I see that! How funny we both post Asian noodle dishes on the same day–and in square-ish white bowls, now less. Hahahahaha–I love the bright colors in yours. “Must have been in a hurry”–b/c there’s no way you would have bought them otherwise, right? LOL! You can acutally use probably any type of noodle in this dish–I ran out of w/w noodles the second time I made it and all I had on hand was regular linguini–worked like a charm! It’s great with whole wheat spaghetti but it will be fine with your regular spaghetti as well. Hope you like it! Mmmmm! You’ve been posting some really delicious recipes! I’ve been so busy with the house, I haven’t been online a lot. I’m so glad I stopped in. This recipe looks yum yum yummy! I love Asian food and I really love spicy food. Ooh, and I will have to try that chocolate cake recipe. Your cake decorating skills are impressive too! Getting your house all made over is worth missing a few things for but I eagerly await your return to the online world! :) Thanks for checking in. Very healthy indeed. Now that it’s summer for my kids, I’m trying to introduce more fruits and vegies in their meals. I haven’t had this dish for a while. Great recipe you have here! I take that as a big compliment b/c even though I do try to take good photos, it is challenging b/c I’m using a point and shoot camera I bought from Walmart for less than $100. I think I’m doing good then I stop by foodgawker and get depressed–LOL! I can’t wait until I can get me a serious camera. Thanks for helping me name it! How many servings is this Veronica??!! I think I may make this with leftover chicken I am making for dinner. Whoops–sorry, I forgot to include servings & nutrition info but it’s updated now. I like the use of whole-wheat spaghetti here, and how it’s just so easy. “asian” is a good way to term it, since I can’t see this as either Chinese or Thai or Viet or Korean, etc. Funny you should mention the name I chose for these. The original was too long and I wanted to call them Spicy Thai Noodles except I’m not very familiar with the different Asian cuisines and wasn’t sure these would pass off as being Thai. So I asked my Filipino friend what she would call them and she said “Asian Noodles” for the same reason. Glad I did so I didn’t look a fool in front of you! tee hee! You’re so silly–you never remember anything about the meals you eat! You liked it better with hot mustard than sriracha. Remember now?